Breeding plants (or animals) for resistance to insects is really just another form of biological pest control. Rather than finding insects to attack the pests, breeders look for genetic traits (or combinations of traits) that reduce an organism's susceptibility to attack or injury by its insect pests. This idea was first tested in the 1870's by C. V. Riley, an entomologist who successfully fought a French outbreak of phylloxera (an aphid-like pest of grapes) with resistant North American rootstocks. Indeed, much of the pioneering work in this field has been done with crop plants because they are usually cheaper to breed and easier to manage than livestock. Recent innovations in genetic engineering, however, are likely to accelerate development of resistant genotypes in poultry, swine, and other commercial livestock. Antibiosis. Plants produce a wide variety of defensive compounds (allelochemicals) that protect them from herbivores. These compounds may reduce growth, inhibit reproduction, alter physiology, delay maturation, or induce various physical or behavioral abnormalities in herbivores. By purposely selecting for plants with high levels of allelochemicals, or by breeding such plants with less resistant ones, it is often possible to develop new cultivars that resist pest injury yet still retain desirable horticultural characteristics. Antixenosis. A physical or chemical property of a plant can make it so unpalatable that it is largely protected from herbivore attack. This type of resistance is often known as nonpreference. It may involve the presence of feeding repellents (or the absence of feeding attractants), or it may involve physical traits such as hairs, waxes, or a thick, tough epidermis that do not provide the pest with a desirable feeding substrate. Alfalfa, for example, has been bred with hairy leaves to deter feeding by the spotted alfalfa aphid. Tolerance. Some plant genotypes are simply able to "tolerate" injurious insects better than others. 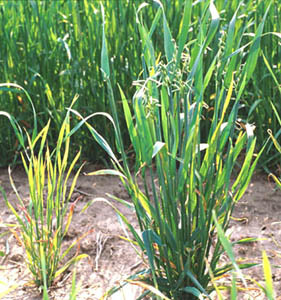 Tolerant cultivars may be exposed to the same pest populations as susceptible ones, but they do not suffer as much injury. Many varieties of field corn, for example, have fairly narrow, brittle stalks. When attacked by European corn borers, these stalks are further weakened and break easily in a windstorm. This wind damage, known as lodging, makes the corn hard to pick with mechanical harvesters. Plant breeders have largely resolved this problem by breeding for corn with thicker, stronger cornstalks. These tolerant cultivars are still attacked by corn borers, but they "stand up" to the injury and insure a harvestable crop. Developing resistant cultivars by traditional breeding methods can be a slow and uncertain process. But new advances in biotechnology now make it possible to pluck genes from one organism and insert them into the cells of a completely different species. 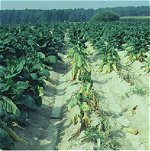 For example, the delta-endotoxin gene from Bacillus thuringiensis, an insect pathogen, has already been isolated and inserted into crop plants (notably cotton and tobacco). Cells of the genetically engineered plants can produce their own toxin, making them "resistant" to certain insect herbivores (e.g., Lepidoptera). Although gene-splicing techniques are still in their infancy, they offer exciting new possibilities for expanding the diversity of resistant plant genotypes.